SKU: 30592. Category: Accessories, Designers, Handbags, Mappin & Webb. Tags: Mappin & Webb, vintage handbags. A Mappin & Webb handbag in excellent condition! I’m not sure of the date but I imagine it may be late 20th Century or even early 21st Century. If you are a Mappin & Webb expert, perhaps you could help me with dating this beauty. I’m afraid I don’t know when the company stopped making handbags. This lovely Mappin & Webb handbag is made of brown leather and lizardskin. It has an adjustable strap so that it can be used as a shoulder bag on those occasions when both hands are needed – for the canapes as well as the champagne! This gorgeous Mappin & Webb handbag also has an immaculate interior divided into two sections. It also has a slip pocket and a zip pocket. You can even keep your handbag in its safe by storing it in its own blue Mappin & Webb dust bag! This Mappin & Webb handbag is a good size for a lot of our modern-day accessories. 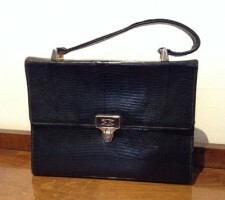 If you collect vintage handbags, this bag would be an excellent addition to your collection. Mappin & Webb is a much sought-after brand and, with this bag, you can see why!